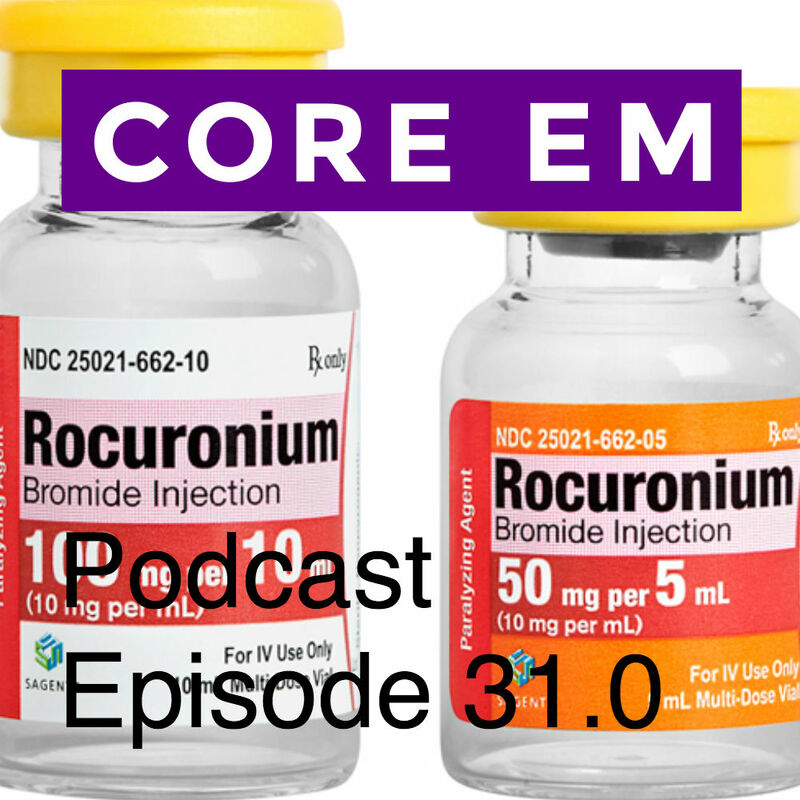 This podcast is a recorded lecture from our conference on why Rocuronium should be the go to drug for RSI in the ED. Strayer RJ. Rocuronium vs. succinylcholine revisited. Ann Emerge Med 2010; 39(3): 345-6. Mallon WK et al. Response to Rocuronium vs. succinylcholine revisited. Ann Emerge Med 2010; 39(3): 346-7. Sluga M, Ummenhofer W, Studer W, Siegemund M, Marsch SC. Rocuronium versus succinylcholine for rapid sequence induction of anesthesia and endotracheal intubation: a prospective, randomized trial in emergent cases. Anesth Analg 2005; 101:1356 – 61. McCourt KC, Salmela L, Mirakhur RK, et al. Comparison of rocuronium and suxamethonium for use during rapid sequence induction of anaesthesia. Anaesthesia 1998;53:867–71. Laurin EG, Sakles JC, Panacek EA, Rantapaa AA, Redd J. A comparison of succinylcholine and rocuronium for rapid-sequence intubation of emergency department patients. Acad Emerg Med 2000;7:1362–9. Herbstritt A. BET 3: Is rocuronium as effective as succinylcholine at facilitating laryngoscopy during rapid sequence intubation. Emerg Med J 2012; 29(3): 256-9. Taha SK et al. Effect of suxamethonium vs rocuronium on onset of oxygen desaturation during apnoea following rapid sequence induction. Anaesthesia 2010; 65: 358-61. Tang L et al. Desaturation following rapid sequence induction using succinylcholine vs. rocuronium in overweight patients. Acta Anaesthesiol Scand 2011; 55: 203-8. While I agree with most of the criticisms of succinylcholine, in my 23 years of practice in busy centers, I have never had a problem with the drug. Since the arrival of Rocuronium, I have been diligent about incorporating its use in my practice. Despite the published literature, my partners and I all agree that Succinylcholine produces good intubating conditions much FASTER than Rocuronium—even with the higher dose 1.6 mg/kg. Not 5 seconds but on the order of 15-30 seconds (our anecdotal experience). I don’t use succinylchomine during cases of obvious contraindication. I always use Rocuronium if I suspect a difficult airway. If I need to intubate someone FAST where I may have only one attempt or I know they are going to desaturate quickly, I am convinced Succinylcholine is the superior drug. if the airway is more difficult than anticipated, its easy to add a dose of Rocuronium on top. I will review the articles you cite regarding the relative desaturation rates between the two drugs. Anthony – appreciate your thoughts and literature is not a substitute for clinical experience. I haven’t had the issues you’ve had with time of onset and the best literature defends rapid onset with high-dose rocuronium. I think your approach is reasonable and the most important thing you said (in my opinion) is that you always use rocuronium in difficult airways. 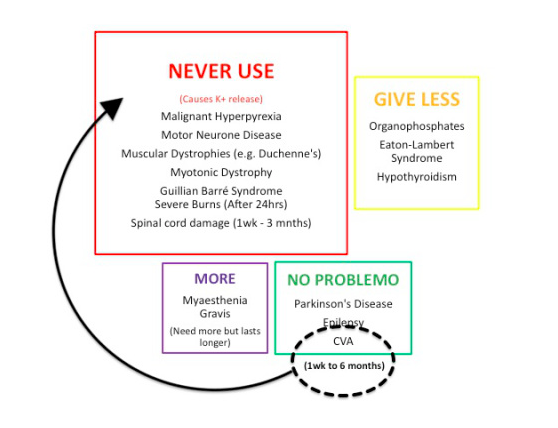 While I agree that it’s easy to add a dose of rocuronium, occasionally, I see issues with nursing scrambling to get meds and with pyxis etc, there’s always a delay.